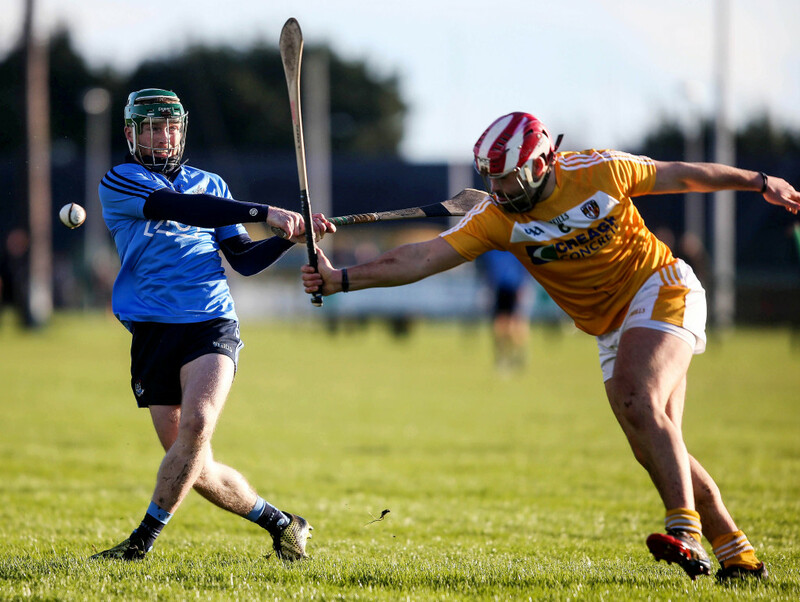 Antrim’s Ciaran Johnston, pictured in action against Dublin’s Ben Quinn in the Walsh Cup last month, says ther Saffrons won’t be taking the challenge of Kildare lightly this Sunday. VICTORY is the bottom line for Antrim’s hurlers this Sunday as they look to make it two wins from two when Kildare make the long trip north to Ballycastle. The Saffrons opened their campaign with a six point victory in Derry on Sunday, but it was not all plain sailing as they trailed by five at the break following a lacklustre opening half. However, they improved in the second half to overhaul the Oak Leafers and claim a vital win and will hope to bring that level of performance into thios weekend’s game against the Lilywhites who lost their opener against Carlow having led at the break. Centre back, Ciaran Johnston says they will be taking nothing for granted this week with the first half against Derry highlighting just how difficult games in 2A will be. “Derry have the same intentions as ourselves and are trying to push hard this year to go as far as they can get,” he said. Antrim’s intentions this year are for a return to 1B following their relegation last season, but this will not be straightforward. It will require hard work and the ability to grind results out to put themselves in the frame for the playoffs, so these qualities will need to be to the fore this weekend once again. “It’s so tight between the teams,” agreed Johnston. “We are in the position we are because we have got there and it’s where we deserve to be. We are under no illusions and don’t go into any game thinking we deserve to win them. We just take every game as it comes and see where that will get us. Antrim have not faced Kildare in any competition since 2010, so both sets of players will be somewhat unfailiar to the other although the Leinster side do have some quality throughout their side. Team captain, Paul Divilly has represented Ireland in the hurling/shinty internationals while goalkeeper, Gerry Keegan and centre-back, Bernard Dray picked up Christy Ring awards last year. Joe Quaid’s men competed well against Carlow in their opener, but the concession of a goal in either half proved to be their downfalll as they fell to a 2-13 to 0-14 defeat and Johnston has some first hand knowledge as to how tough this weekend could be. “They have been going rightly over the last few years,” he acknowledged. Johnston has slotted in to the centre back position this season having occupied midfield and wing-back berths in recent years and is enjoying this new role with the county, one he is used to from club hurling. “It’s sort of my natural position,” he explained. “Kevin (Ryan) put me in at midfield and then the club followed on, but I would naturally be a centre half back from an early age. While Johnston is happy with his new role, he is also enjoying life under PJ O’Mullan who is in his first year in charge of the Saffrons. O’Mullan has brought fresh ideas and some new faces into the job with Johnston hoping Antrim can get back on track after a nightmare 2015. “PJ has come in and it’s very enjoyable,” he reports. “There is a fresh approach. I suppose last year, everything we tried to do kind of went against us, but that can happen to any team.